All around excellent entertainment. Twist it, turn it, tilt it. However you’d like it, our Floor models are up to the challenge. 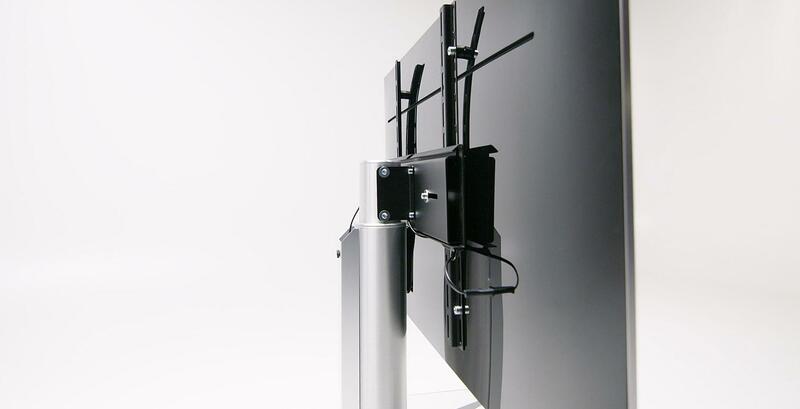 Castors make them easy to position, and a pivoting TV mount enables you to watch your favourite shows from any angle. Our floor models do it all. Thanks to their wheels, they are super-mobile, in addition, the rotatable TV mount allows television from every angle. Top quality: All models are high quality processed. The glass plates are scratch-resistant, the aluminum columns finely sanded and sealed. All models have thoughtful cable routing. Spectral Floor is available with glass bottom in clear or black. You can turn and turn it as you like: our floor models do it all. Thanks to their wheels, they are super-mobile, in addition, the rotatable TV mount allows television from every angle. The models QX600SP and QX601SP are optimized with soundbar adapter for the Sonos PLAYBAR. Download the Floor product portfolio in pdf format.